To accentuate the importance of teamwork, American basketball star, Michael Jordan said, ‘Talent wins games, but teamwork wins championships’. With the teamwork between Grain SA and the Jobs Fund Project the agricultural championship is sure to be won. Grain SA has long been committed to farmer development and assisting previously disadvantaged farmers in the commercialisation process. The knowledge transferred by the study group programmes has impacted positively and made a direct contribution to the household security of subsistence farmers. The mentorship of farmers during the critical summer months has made a big difference to farmers’ end results. Since Grain SA believes that the success of any development programme is directly linked to the involvement and a sense of ownership by the beneficiaries, farmers were asked to make an own contribution which escalates each year. According to Jane McPherson, programme manager: Farmer Development, experience has shown that farmers must be assisted for a limited period of time and their own contribution should increase each year until they can fund the planting themselves. ‘If this is not the case, then farmers participate while they receive grants and when the grants stop, the whole effort stops. We do not want this to happen’, she adds. The farmers saw overwhelming results in their maize crops. Their successes attracted much interest and increasingly more farmers began asking to be part of the project. 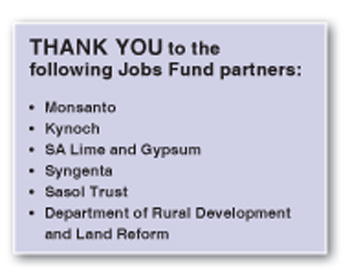 Great excitement reigned when the Jobs Fund turned the spotlight to the agricultural sector. Since their explicit mandate is job creation, income generation and poverty alleviation, a proposal was submitted to expand on the project which Grain SA had already set in motion. An individual farmer is part of the project for four years and thereafter he/she should continue on his/her own. The number of farmers increases by 850 per year up to a maximum of 3 400 farmers (which means that in the last year 10 200 ha will be in production). Each farmer will start with 1 ha and may increase the area to a maximum of 10 ha each. The mentoring to farmers will be reduced by 25% per year so that the farmers gradually learn to do all activities themselves, understanding the impact of their actions. All the Jobs Fund projects work on the basis of 1:1 funding. They will only match the funding that is put up by other partners. In this instance the cash deposited by the farmers together with the funding from Grain SA’s other partners, including the discounts offered by the input suppliers, counted as Grain SA’s contribution which was then matched by the Jobs Fund. The Jobs Fund contributes the full cost of the mentoring and assists with the shortfall in the cost of production inputs. Because of the amazing harvests the farmers who form part of this project have achieved, 3 023 new farmers working 4 317 ha signed up for the 2016/2017 season. Grain SA is really excited to see that farmers are suddenly seeing hope for their farming enterprises. While farmers are expected to make a financial contribution, they are supported with knowledge and financial assistance, the true investment made by a project such as this is in the individual. Initially the farmers contribute 25% of the production costs with industry contributing 30% (in the form of discount) with the balance for the inputs being carried by the Jobs Fund. As the percentage of their own contribution will increase each year, the end-goal is that by the fifth year the farmer will be able to plant without any further financial support and will consequently be an independent farmer. In this way, Grain SA hopes to have sustainable production on all the hectares after the end of the project. The farmers will know what to do and they will have grown accustomed to bearing the costs of the inputs. The potential to change the demographics of agriculture in South Africa through this network of partnerships is huge and exciting. Mr Mzwayi and Mrs Celiwe Zuma from the Hlatikulu region have access to 6 ha of arable land which they rely on to support their fam family. They entered into the Jobs Fund project in 2015. Previously they had relied on traditional practices, but through the training they received in the Grain SA Jobs Fund project, have adopted modern methods by implementing no-till practices. Previously they were satisfied with a 1,5 t/ha to 2 t/ha crop. In the 2015/2016 season they achieved a 4,1 t/ha crop! Besides the direct benefit of food security for the Zuma’s as a family, they have also provided part time work for 15 people through the season. This has truly been food security and job creation in action. Mr Inhlanhla Mngadi and his brother, Thula became involved with Grain SA and the Jobs Fund project in 2015. They have access to land on the banks of the Bushman’s river in the Kwa-Dlamini area, 30 km from Estcourt. The brothers planted 2 ha white maize through the project and harvested an outstanding 11 t/ha. 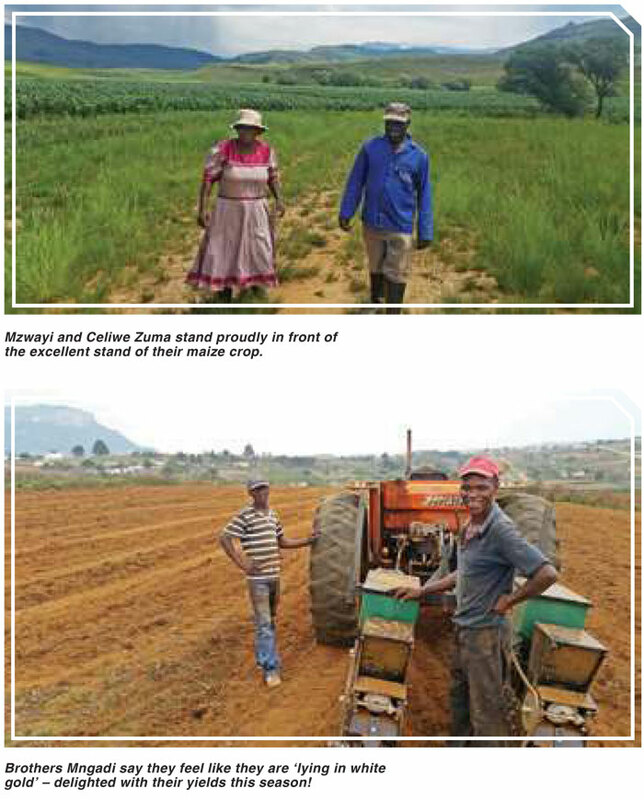 According to Gavin Mathews (mentor) the Mngadi’s have invested their profits straight back into the Grain SA Jobs Fund project for the new season and intend planting 8 ha next season. During December 2016, Mr Jannie de Villiers (CEO of Grain SA) decided to see first-hand what difference this project is making. 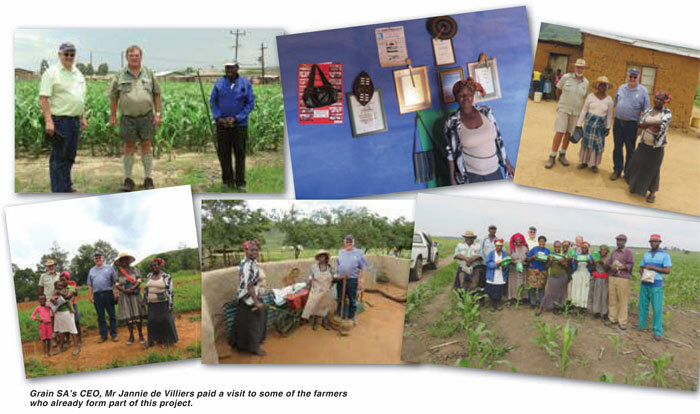 ‘We receive so many hand-written thank you letters of how our involvement has changed lives, that I decided to make time in my schedule to pay these hardworking farmers a visit’, De Villiers shares. Grain SA’s goal remains commercial production – they are not trying to turn farmers into commercial farmers, but to improve their living condition by equipping them to improve their skills.